The Astanza Duality laser machine is a powerful system that utilizes the latest in cosmetic laser technology to completely erase tattoos, vascular lesions and pigmented lesions. Offering a high repetition rate which releases pulses faster than other laser tattoo removal systems, the Duality laser from Astanza allows for faster treatment over larger areas and less pain for clients. The Astanza Duality is a powerful and incredibly versatile laser machine that provides the high performance and results that you’ve been looking for. The Duality doesn’t just get rid of tattoos faster than the competition, but it works on a huge wavelength of colors to get rid of even the most stubborn tattoos in less time. The laser system’s combination of super short pulse duration (6000 picoseconds) and ultra high pulse energy results in powerful ink fracturing in even dark and tough to remove inks in less visits. Unlike older laser tattoo removal machines, the Astanza Duality was designed to remove a wider range of ink colors, including blues, greens, oranges, purples and reds. While many lasers stop being as effective after the first one or two treatments, the Astanza Duality takes treatments a step further, resulting in complete removal of inks later in the removal process. It’s the perfect choice for all types of laser tattoo removal practices and cosmetic practitioners. With the Astanza Duality, patients can experience full tattoo removal with faster results than older types of lasers, which often require 15-20 treatments before ink is completely removed. The Duality allows cosmetic practitioners to get rid of tattoos and dark spots faster and with less pain for the patient, offering an effective and more affordable skin treatment. 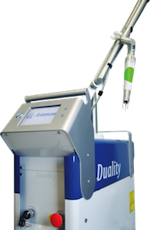 The Duality features a unique, square-spot beam and uniform heating mechanism which ensures less risk for pigmentation changes in those with darker skin and fewer “hot spots” on the skin where injury can occur. If you’re looking for a powerful laser tattoo removal system that is a powerful, affordable and safe choice, the Astanza Duality is a great option. Interested in adding the Astanza Duality laser system to your cosmetic treatment options? SunrayLaser.com has great deals on used Astanza Duality laser equipment with savings that are up to 60% off the original price! See for yourself how much you can save on high quality used laser equipment when you buy from SunrayLaser.com.